Hinged doors with full length recessed pulls. Single-key core removable lock with 4 keys. Steel ball bearing telescoping slide suspension. Two 19 1/4" deep file drawers operate on steel ball bearing, telescoping slide suspensions and hold letter and legal files. Reinforced double-wall drawer fronts provide extra stability. 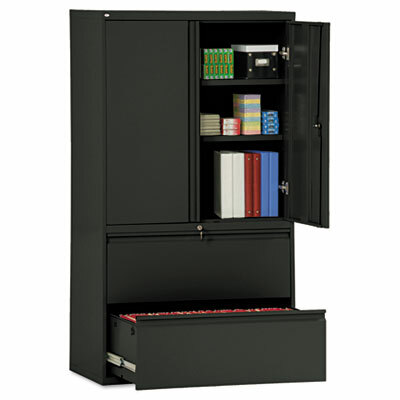 Cabinet provides ample storage and features hinged doors with full-length recessed pulls and two adjustable shelves. Single-key core removable locks with four keys. Four adjustable leveling glides. Metal construction with a durable powder coated finish.